If you're after a casual yet absolutely chic getup, pair a black blazer with black leather skinny pants. Both items are totally comfy and will look fabulous paired together. Finish off your outfit with Sole Society joanan sandal. If you're a fan of functionality dressing when it comes to your personal style, you'll love this super cute pairing of a black and white floral kimono and a black playsuit. You could perhaps get a little creative in the footwear department and dress up your look with Sole Society joanan sandal from Nordstrom. For a killer-meets-chic ensemble, consider pairing a yellow button down blouse with black dress pants — these two pieces go really well together. Complement this outfit with Sole Society joanan sandal from Nordstrom. If you don't like being too serious with your combinations, reach for a red midi dress. You could perhaps get a little creative in the shoe department and lift up your look with Sole Society joanan sandal. Opt for a black embroidered peasant dress if you're on the hunt for an outfit idea for when you want to look casually cool. 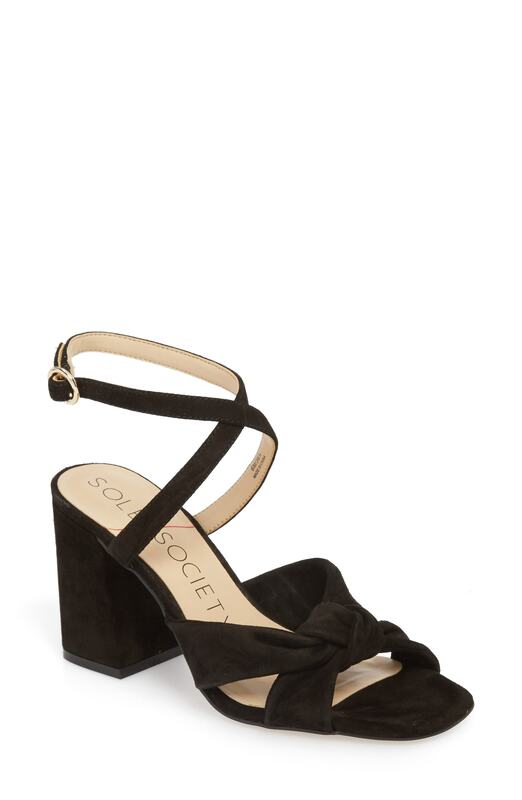 Kick up the cool of your outfit by complementing it with Sole Society black suede heeled sandals. This combination of a white silk long sleeve blouse and black satin shorts is clean, stylish and so easy to recreate! When it comes to shoes, this ensemble pairs wonderfully with Sole Society joanan sandal from Nordstrom. For a look that's very simple but can be dressed up or down in many different ways, opt for a black leather sheath dress. When it comes to footwear, this look is finished off really well with Sole Society joanan sandal from Nordstrom. If you're on the lookout for a casual yet absolutely chic ensemble, consider teaming a white lace crew-neck t-shirt with black skinny jeans. Both garments are totally comfy and will look fabulous paired together. Sole Society joanan sandal will instantly lift up even the laziest of looks. We all want comfort when it comes to dressing up, and this combination of a white off shoulder top and blue denim shorts is an amazing example of that. Bump up the cool of your look by complementing it with Sole Society joanan sandal.